A survey by the Association for Financial Professionals on risk finds 78% of respondents say accurately forecasting risk is either as difficult as or more difficult than it was 3Ys ago. Meanwhile, the top areas cited as having the greatest impact on company earnings over the next 3Ys are: political and regulatory uncertainty (43%), tougher competition (42%), customer satisfaction and retention (40%), currency volatility (30%) and product innovation (26%). In banking, these data points and others indicate how important it is to try and measure, monitor and control all sorts of risks. So, to help bankers, we focus our energies today on one of those risks, namely strategic risk. After all, community banks today face a number of strategic risk challenges that require careful and diligent management to ensure profitable and sustainable futures. With interest rates low, profit margins squeezed and competition growing, community bankers need to carefully plan strategies that can manage risk and deliver results. Bank regulators have also taken notice of the strategic risks facing banks in banks. They have also highlighted areas where they suspect strategic risks could pose problems. Community bankers can tighten up their own management of strategic risk by paying attention to these potential problem areas. One challenge that regulators see is how banks respond to heightened lending competition. They indicate some banks are adopting strategies that loosen lending terms or are trying to expand into areas without proper expertise, policies and procedures. These options all can heighten strategic risk. Banking innovation, including new technology, is another area that bears close monitoring. While banks need to try to keep pace with technological innovation, they must be cautious when following the strategy into unfamiliar - and potentially riskier - territory. Often banks will find they need to rely on third-party relationships to help enable technological innovation, but that requires a thorough understanding of how such relationships can impact a bank's risk profile. Ultimately you need to have a clear strategy for innovation and how it relates to the bank's overall goals and mission. To avoid issues, bankers should also be careful about venturing into products that are not fully understood. Bank mergers and acquisitions can also be risky territory as banks seek growth from all sources. The increase in M&A is partly a result of banks seeking to improve market penetration, gain economies of scale and enhance shareholder value. But, an M&A strategy comes with its own risks, as regulators demand banks have adequate controls when blending two businesses. Finally, the ongoing low-interest-rate environment has eroded the earning potential of banks and can prompt more risky strategies to boost income and yields. Bankers may decide to try to increase yield by extending asset duration, which increases exposure to shifting interest rates. 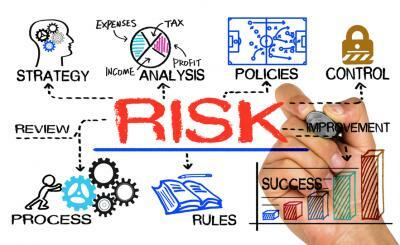 In essence, managing strategic risk means trying to master the art of risking enough to win - without endangering the underlying business. The problem is that it is difficult to know exactly how much risk is too much, because the future can be fickle. Yields slipped 2bp as new Fed commentary points towards an unlikely September rate hike. University of Michigan research finds performance is reduced by 50% when people multitask, as it takes the human brain time to figure out where it left off--stop multitasking and stop fighting your brain. An RMA survey finds bankers rank the following risk metrics as the most important for managing interest rate risk: net interest income (97%) and economic value of equity (89%). A survey by T. Rowe Price finds nearly 50% of parents with college savings accounts for their kids have withdrawn some of the balance in the past 2Ys, but only 18% used it to pay at least some of their child's education and only 3% used it solely for education. A Compensation Advisors survey of bank executives finds the percentage of respondents who say stock options or equity grants are effective as tools to tie the executive's interest with shareholders/owners is 41% less at a private institution than a public one (30% vs. 51%, respectively). Meanwhile, the percentage indicating options or grants are not effective at all is 125% higher at a private vs. a public institution (18% vs. 8%). The Wall Street Journal reports that from 2000 to 2008 the FDIC received 1,637 applications for new banks and approved about 75% of them. However, since 2009, the FDIC received 50 applications and only approved 6%. A KPMG survey of large bank executives finds key priorities for transforming the branch experience are: deploying digitally enabled self service capabilities for teller transactions (37%), deploying digitally enabled self service capabilities for account opening and maintenance (35%), investing in branch technology to increase operational efficiencies (15%) and redefining banker roles (9%).